If last week’s blog post was all about the before pics and design plan, then this week is all about the FUN tile install we’re doing. I’ve never actually seen tile installed like this before so I am pretty excited. As a designer, it is my passion to come up with cool ideas that my client’s will love. But it’s funny because sometimes you come up with these wild ideas without fully flushing out HOW to make them happen. Such is the case with this tile. But before we talk about the install, let’s go over the idea. The gist of it is that I wanted to take penny tile and run it on the floor and up all of the walls. And then to create a shape by using 2 different color tile. The shape is to be on the floor and 3 of the 4 walls. The back of shower wall and wall to the right when you walk in will be 100% covered in tile, and then the vanity wall will be all tile except for a huge mirror that goes from wall to ceiling and covers the edges of the tile, ending just before the shower glass. The wall that the door is on will stay painted white as it’s about 80% door and/or covered by the vanity so it doesn’t need to work hard for the design. In the rendering you can see the shape created by the 2 different colors of tile. We have grey on the inside and then white everywhere else. The dots show you where the penny tile is (aka everywhere, just don’t forget that the white areas are tile, too). Above the vanity and toilet is a custom frameless mirror. The glass will be a simple panel from floor to ceiling so that nothing takes away from the tile. Now on to the tile install. 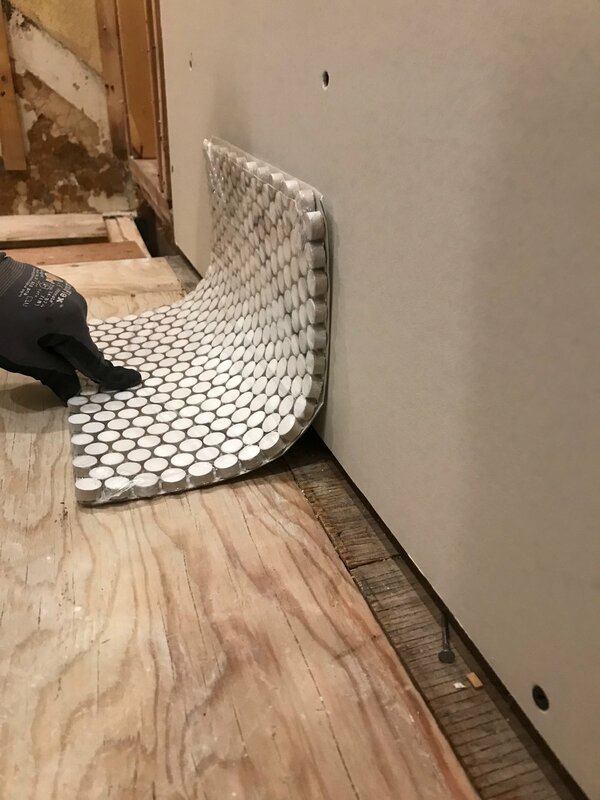 When you install tile you oftentimes see people doing something different on the walls than they do floor, and then put a tile or wood trim piece along the base of the wall to cover the ugly edges of the tile. Well, in order to create this cool seamless look I couldn’t have that, right? And I didn’t want to lay the tile on the floor and then just do it on the wall perpendicular as the penny rounds wouldn’t have aligned. So, in comes the curve! We’re installing it so that the same tile wraps up onto the wall. And to do that we have to build up the corner with cement so that when we do the install it has something strong to adhere to. We’re doing this on both the floor to wall transition and in all of the wall-to-wall transitions (aka corners). It is going to look great! I am excited. Doing this curve is having a snowball effect on other items too. It means the back of the vanity and shower glass have to be rounded. Stay tuned for how I tackle both of those. Next week I’ll share some progress pictures and tape out the layout of the tile so you can see it come to life! We’ll also show some final material selections. Thanks so much for following along (make sure to follow us on Instagram where we do daily updates!) and don’t forget to check out all the other ORC participants! Keep up to date on and all of our projects and inspiration by following us on Instagram, Pinterest, email (see footer!) and our blog with Bloglovin'!